Keeping your house clean and your pet comfortable are two priorities pet owners know all too well. On one hand, you’d want your feline friend to walk around as they please, and on the other, you have your furniture and floor to think about, too. Which is why cat litter boxes are heaven sent – your cat gets to roam around wherever he or she pleases while also keeping your house clean and almost completely free from odor. The Hagen CatIt Hooded Cat Litter Box is one of the best selling litter boxes in the market today. Thousands of cat owners from around the world swear to its durability, high quality, and effectiveness when it comes to making your kitty comfortable and making your home free from litter mess. If you’re looking for a great cat litter box for your cat or multiple cats, then you’ve come to the right place. Let’s take a look at CatIt’s Hooded Cat Litter Box features and why it might just be the best option for you and your beloved feline. The box’s dimensions are: 22.4″ in length, 18.3″ in width, and 15.3″ in height, which makes the box taller than most litter boxes. It allows your pet to turn around and stand up, even when the top lid is in place. There are basically two components of the litter box – the top and the bottom. The bottom holds the cat litter while the top serves as its hood or cover. The top component can be folded back or can be removed completely, making cleaning easy and convenient. The box features a transparent swinging door which is specially designed to be cat-proof, preventing your cat’s tail from being caught and allows it to see through the door. The door can also be removed for convenience if you’ve got a playful cat who wants to get in and out of the box often. The box features a carbon-impregnated filter that keeps cat waste odor at bay and contained. Large Box – The box allows for two cats to get comfortable inside, and for one large cat to comfortably turn around, sit, and stand up. Easy to Clean – Because the top component can be folded back, scooping and refilling cat litter is basically a breeze. Carbon-Impregnated Filter Keeps Odor at Bay – Cat poo and cat urine smell are nasty and this feature keeps them at bay, so you won’t have to clean up after your cat immediately once they use the litter box. Rounded Design – Cats won’t be able to chew on the litter box and damage it, compared to boxes that have sharp corners which cats love to bite on. Deep Depth – This means you’ll have to use a lot of cat litter to fill it up. Handle Can’t Take the Full Load – You won’t be able to use the box’s handle once it’s filled with cat litter. You’ll have to take out a good amount of litter if you want to carry the box and move it to another room. Filter Doesn’t Have Protection – Cats can easily chew on the carbon-impregnated filter since it’s located inside and on top of the box. The Hagen CatIt Hooded Cat Litter Box is great for any pet cat owner who needs a top quality litter box that provides privacy and enough space for your pet feline to move around. If you have two smaller-sized cats, they can both use this box as it’s big enough to accommodate two regular sized felines. It is not, however, ideal for cats that don’t squat when they eliminate waste or urinate. Since there are two components to the box, there’s a probability that urine might leak out of the seam between the top and bottom. The box is also not ideal for cats who don’t like to be enclosed in small spaces. To remedy this, the top component can be removed but it defeats the purpose of buying a hooded cat litter box in the first place. 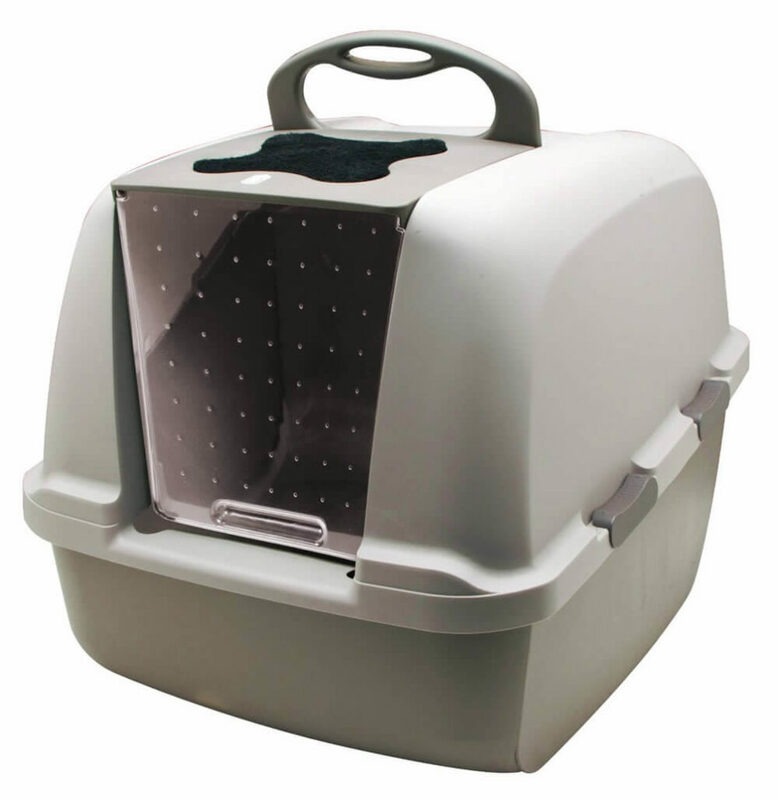 The Hagen CatIt Hooded Cat Litter Box is a great investment for your pet cat. It’s sturdy, durable, safe since it features a rounded design, and provides easy access for both you and your cat. Its basic advantage may also be its flaw – because the box is large, you’d need a good amount of litter before you can fill it up. The box also may have a functional design flaw since you can’t use the handle when it’s filled with litter – a sturdier handle would’ve been so much more appropriate for its deep depth. Nevertheless, this bestselling litter box is a must-have addition to any pet cat owner who wants to provide a good place for their cat or cats to relieve themselves, as well as to keep the house clean and odor-free. There is a lot of cat with incontinence. And we have a solution for you. Visit our home page.